Thoughts on the state of today's masculine attire. Irascible grousing on the one hand, helpful advice on the other. Gentle admonition for modern youths, and a wakeup call for adults. One man amongst many, sounding the sartorial clarion call. This week, we'll return from the land of the Emmys, and talk some more on our series of modern neckwear...for there is one more variation yet to be discussed! We've worked our way through history, from ruffs to stocks, from cravats and steinkirks to ties. We've looked at modern ties, from bow ties and long ties to ascots and day cravats. This week, we honor the simple square: the neckerchief. Let's look at its history, its modern use, and uncover a surprising secret. Unlike the cravats and ties of gentlemen, the neckerchief was the neckwear of the working classes: the blacksmiths, the farmers, the ranchers, the sailors, the cowboys, carpenters and cooks. And like the working men themselves, their neckwear was not simple adornment, but multi-functional. Neckerchiefs are always worn diagonally, with two opposing points tied together. As a simple cotton square tied about the neck, it sopped up sweat while you toiled in the sun. Soak it in in a stream and tie it about your head, and it kept you from overheating in the summer. Worn over your nose and mouth, it was a filter from dust or fumes. In the event of an accident, it could be used as a sling, (or more direly, as a tourniquet.) And it could even be worn under your collar like a "normal" tie, if that need arose. 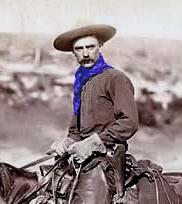 The neckerchief is thus an image inseparable from the cowboy/ranch-hand of the American West. Today, it is seeing a resurgence of sorts, due to its ease of use, the ability to be worn with an open collar, and its versatility. 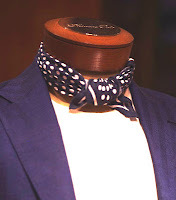 Many people see the day cravat as an upper-class affectation, and the earthy roots of the humble neckerchief provide an alternative that nevertheless produces the same sartorial effect: something to take up space under an open collar. 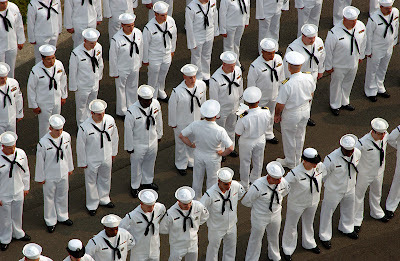 The neckerchief is most often seen with Naval uniforms worldwide, where it has been worn in that utilitarian capacity since the 16th century. The Navy style is to fold it in a triangle, and roll from the point to the ends to form a tube. Then it is tightly twisted, placed around the neck under the collar, and tied low in a square knot. The U.S. Navy standard for the neckerchief is thirty-six inches square, (that's a yard, for you Europeans, 91.5 cm) and technically anything called a "neckerchief" must be close to that dimension. Not only is 36 a nice round number, it gives a diagonal measure of fifty-one inches, which (if you will recall from our study of "starcher" cravats) is ample enough to wrap around the neck twice with room for a large knot. Let's take a quick look at some examples of the neckerchief. Sean Connery (1968, as Shalako) wears his neckerchief tightly rolled up, and knotted like a steinkirk, with the ends falling freely. This is the classic cinematic "cowboy style." 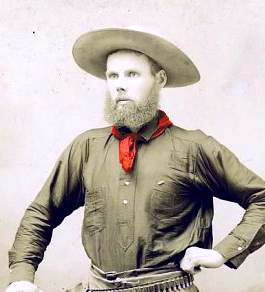 This (real) cowboy wears his neckerchief unrolled and loose, in the simplest way possible: with the ends twisted together in front in a simple knot. He wears it over (and covering) his shirt-collar. 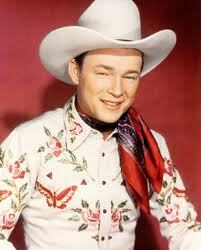 Roy Rogers wore his in a showman-like style, with the knot at the side of his neck, and the ends flowing and loose as a ponytail. It looks odd today, but you need to bear in mind that in the mid-twentieth century, all things cowboy and western were very much in vogue in entertainment and popular culture, and rugged manly men in flamboyant outfits like this were more or less the standard for cowboy troubadours. Remember, too, that in black-and-white on a twelve-inch television screen, this would have appeared much less jarring; likewise from a hundred feet away on stage at the Grand Old Opry. 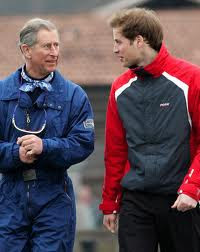 Here's a modern example of wearing the neckerchief. Notice it is worn wrapped front-to-back-to-front, with a small knot. In modern parlance, this is called a "cowboy turtleneck." 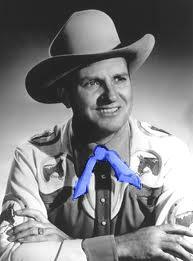 Gene Autry wore a rolled bandanna like this, and it became the ad hoc "cowboy tie." 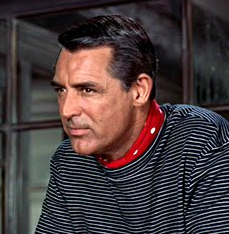 It is rarely seen today under shirtcollars; most opt for the under-the-shirt look, exemplified by Cary Grant in the first image of this post. Prince Charles demonstrates the same look as Gene Autry above, but with a slightly smaller bandanna worn right around the neck, with the ends showing. The effect, you'll notice, is reminiscent of a bow tie, with the points standing out. 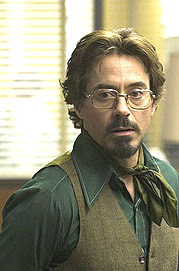 Robert Downy Jr. (Zodiac) shows the most common way to wear a neckerchief today: bandanna sized, loose around the neck, under the shirt, with the points out. A more-put-together look crosses the line between neckerchief and day cravat, with a folded style, a Gordien knot, and the points nearly hidden. There is no doubt that we are seeing more neckerchiefs of all sorts in recent months, but whether this is a long-term shift in style consciousness, or merely a flash fad, only time will tell. That a simple silk square under a shirt is easier and more comfortable than a tie, there is no doubt. As fewer modern men wear ties in their everyday lives, perhaps we will see an increasing number taking up the neckerchief as an alternative. There is no "wrong" way to tie a neckerchief. Unlike the highly-structured cravats of yore, the multitude of tie knots, and the "proper" way to tie an ascot that we've seen in previous weeks, the working-man's neck scarf reveals its rustic roots in that there is no set method of wearing it! Fold it, twist it, roll it, scrunch it, under shirt or over, under collar or over, and tie with a simple knot, a square knot, a Gordien knot, a four-in-hand knot, pin it, or woggle it. 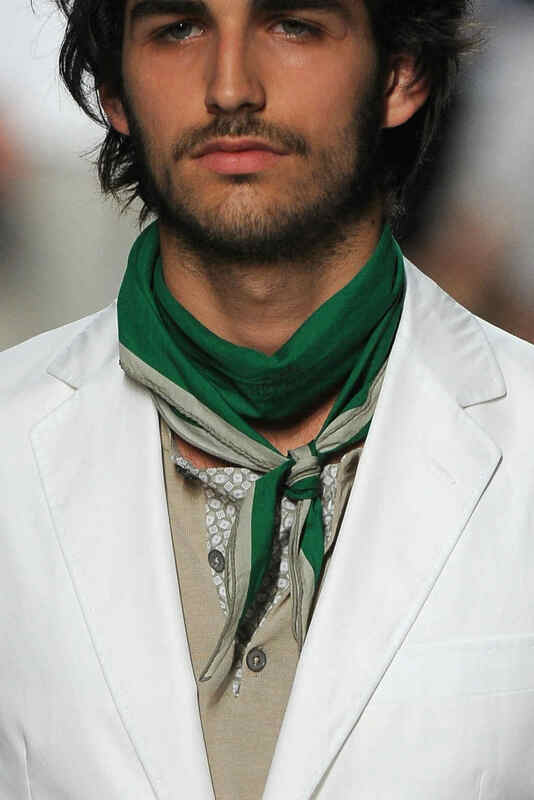 There's not a lot of variety even possible with a bandanna due to its diminutive size, but the extra length of a true yard-wide neckerchief lends itself to a greater amount of sartorial expression. Of course, just because there is no set method of wearing them, doesn't mean that there is anything new under the sun. Wear a neckerchief like Cary Grant above, and you're wearing a Cravate Collier de Cheval, although you may not realize it. Likewise, Gene Autry is wearing his like a Cravate à la Colin. There may be new names, like a "Cowboy Turtleneck," but scratch the surface and you find a simple Cravate à l'Oriental! You may think you are being cutting-edge by twisting the points in front and then tying them in back, but in fact you have just "discovered" the Cravate à l'Irlandaise! The reason for these similarities becomes immediately clear if you've been paying attention through our Weeks of History: for a neckerchief is in fact nothing more nor less than the cravat of 1830, merely unstarched and worn under the shirt. Once you have that "light-bulb moment," and realize that The Art of Tying the Cravat isn't as pointless and obsolete as you thought it was, and may in fact be re-inventing itself day by day, you should go back and read it with renewed vigor. You'll start seeing those hoary old knots re-appearing, being worn by folks today who think they are being hip and trendy. And then you can be hip and trendy, too. Click here to go to the next essay chronologically, Part Nine of The Secret Life of the Tie. 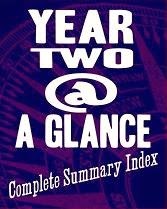 Click here to go back to the previous essay chronologically. Click here to go back to Part Seven of The Secret Life of the Tie. Click here to go back to Part One of The Secret Life of the Tie. Click here to go back to the beginning. Thanks for the great post. Along with hats, the neckerchief is part of my standard look -- when people search for me in airports, they look for a hat or splash of color around the neck. 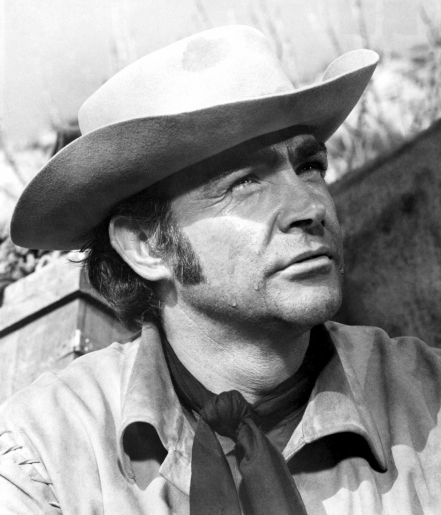 Oddly enough, the two people most people call to mind when they see one on me is either Roy Rogers or Cary Grant -- and I could not think of two more dissimilar people! Sartorial historian, tailor and author, who developed the unique Razor Square™ pocket squares, and is the man behind Mr. Thompson's Ties & Squares. Ivy Style - The best place to get your Trad on. Dandyism.net - Get your fill of insouciance galore. The Cutter & Tailor - Details from the bespoke tailoring professionals. The Black Tie Guide - Proper evening wear, worn properly. Made By Hand: The Great Sartorial Debate - Dissecting the way the best clothes are made. Ask Andy About Clothes - The original style megaforum. The Art of Manliness - Manly things for manly folk. Hats Plus! - Hat knowledge and etiquette. Mr. Thompson's Ties & Squares - Real bowties and Razor Squares. Alden - More real shoes. Darcy Clothing - Real proper evening wear. Watchismo - Wristwatch as Art. David Morgan - Real hat feathers. Check out the advertisers below, and they'll be so pleased, they will put a penny in my coffer out of the goodness of their hearts. Really. 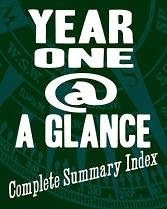 All text content © 2011-15 Wm. J. Thompson. All images © their respective owners. Simple theme. Theme images by caracterdesign. Powered by Blogger.